In what can be best described as a public family brawl, the University of California San Diego (UCSD) has filed a lawsuit against the University of Southern California (USC) alleging breach of fiduciary duty, civil conspiracy, and commission of computer crimes related to a major Alzheimer’s research project called the Alzheimer’s Disease Cooperative Study (ADCS). The trigger for the lawsuit was the June 21 resignation of the Director of ADCS, Dr. Paul S. Aisen, from his job at UCSD, in favor of a new position that University of Southern California created specifically for Dr. Aisen. USC’s offer to Dr. Aisen also included funding to create a new Alzheimer’s research center in the San Diego area. 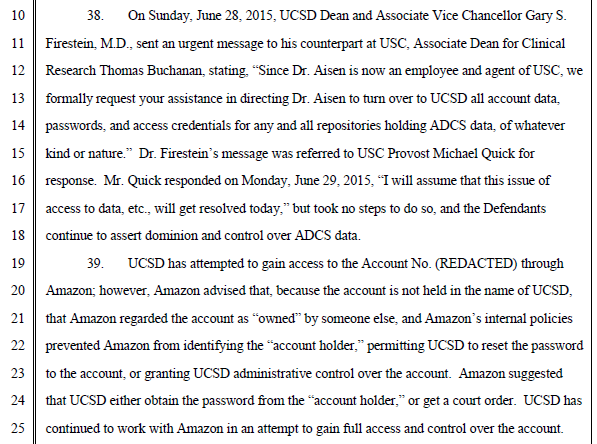 The habit of top tier universities poaching research teams from each other is fairly common practice, and Dr. Aisen’s move would typically be a one paragraph story. What makes this story far more interesting is the tug-of-war developing over the enormous amount of Alzheimer’s research data that the ADCS project has accumulated since its 1991 inception. Whoever asserts de-facto control over ADCS data is in a strong kingmaker role, with the ability to influence which groups have access to the data, and also which groups can contribute to the data. And the stakes are growing larger each day, as clinical research efforts ramp up with a new set of biomarker targets that may finally break down the wall on finding an effective Alzheimer’s therapy. The profits from any future blockbuster Alzheimer’s drug therapy will easily be over $100 Billion. Given the large amount of public funding for ADCS, who has ultimate ownership and control of ADCS research data – (1) the ADCS Director, (2) the academic institution that hosts the ADCS cooperative agreement, (3) the federal funding agency (National Institute on Aging, etc), or (4) another entity not yet named? We will update this article with replies from the above. Stay tuned. July 27 update: San Diego Superior Court Judge Judith Hayes will issue a preliminary injunction this week that requires USC to surrender custody of the Alzheimer’s project back to UCSD. This ruling probably will not be the end of the matter, however. Expect further wrangling between the warring parties, as there is much at stake on who will exercise de-facto control over the ADCS database and day-to-day operations. See also: Should Medicare Cover the Cost of Brain Imaging Tests for Alzheimer’s Diagnosis?